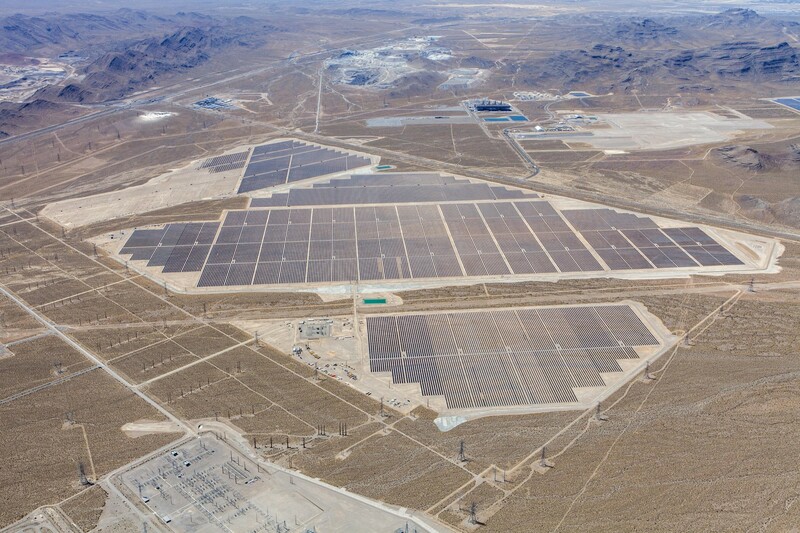 The 234 MWp / 179 MW(ac) Switch Solar project is located in Clark County, Nevada northeast of Las Vegas on approximately 1,600 acres of land managed by the US Bureau of Land Management (BLM) in the Dry Lake Solar Energy Zone (SEZ). The project, reached commercial operation in December 2017 and will sell its output and environmental attributes under three 20-year Power Purchase Agreements to subsidiaries of Nevada Energy. The project was acquired by EDF RE in July 2017 from First Solar. In June 2018, EDF Renewables announced the signing of Purchase and Sale Agreements (PSA) by which PGGM Infrastructure Fund will acquire a 50% ownership interest in the Switch Station 1 Solar and Switch Station 2 Solar. The expected electricity generated at full capacity is enough to meet the consumption of up to 46,000 average Nevada homes. This is equivalent to avoiding more than 265,000 metric tons of CO₂ emissions annually which represents the greenhouse gas emissions from 52,000 passenger vehicles driven over the course of one year.